Not much action seems to be going on except for filtering and racking of the grape must. It is quieter today because not all the pickers are working. Most of the grapes need more time on the vine. Natural fermentation is already starting up and undoing the cold settling. 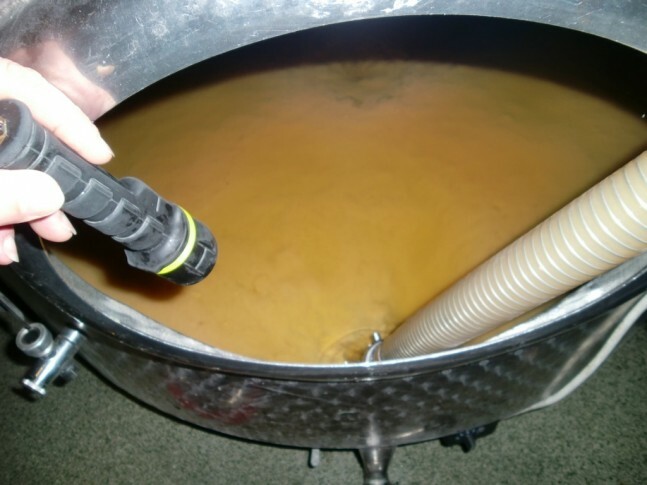 When the ferment starts, the lees get stirred up and makes the final wine coarse and cloudy. This is unwanted. When doing the racking, we want as little air in the transfer pipes so that air won’t get injected into the grape must and stir up the lees. 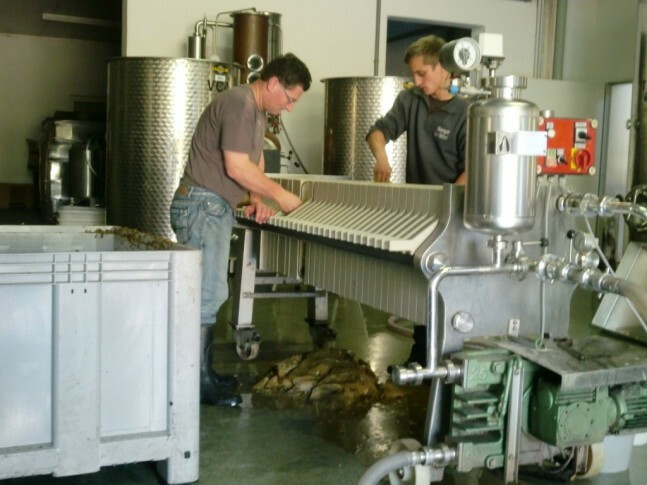 To know when the juice is not clear any more during the transfer, a sort of “lees catcher” is being used. A torchlight is used to see if the catcher has collected a lot of lees. 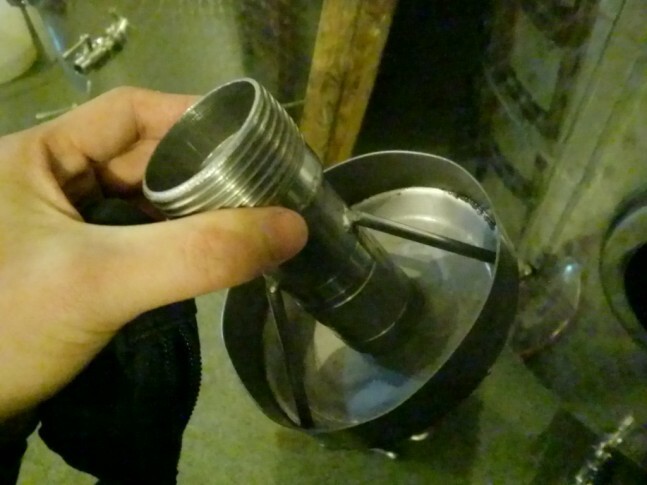 Once it is considered too cloudy, the pumping of the juice is stopped and the remaining cloudy juice is fed through a filter to get the particles out. This filtration is done to recover more of the product (clear juice) from the remaining cloudy must. Today, we ended early. A group of Australians came to the cellar door for a tasting and the winemaking crew mingled around with them. Some wonderful wines were tasted. Below are my tasting notes for Salomon. Aromas of green apples and pear. A very light wine that is best served on a hot day. A light citrus finish. A riper version of the Hockterrassen. A sort of gum smell with light mintiness. High acid and flavours of bananas and minerals. Aromas of gum Arabic and sesame seed oil, herbs and a mineral, peardrop nose. Dry, beautiful striking acid and is in balance with the flavours of mint and peardrops. A lifted nose, stonefruit, aromatic, mineral and blossoms. On the palate, flavours of apricots and a sort of light muscat flavor. A flinty finish.Lovely acid with food. Coming from 50 year old vines and harvested at Spatlese level. A lovely stonefruit nose, with mineral and ripeness in it that suggest a feminine wine, menthol and white pepper nose. On the palate, citrusy, pears, mineral and a lightly oily mouthfeel with lingering white peppers in the background. A Long length. Floral on the nose with light lychees, a very fresh nose and easy to drink. The Salomon Estate made in Australia, Finniss River was also tasted. Chocolate on the nose which huge plums and lifted raspberry/blackberry aromas. A punchy nose. Ripe tannins and a sort of fruit sweetness mingled with coffee and vanilla. Aromas of blackberry and chocolate, very ripe fruit with a very slight herbaceousness.Concentrated and dense on the palate with light cedar. Ripe notes of blackberry and vanilla. A light mushroom and pencil lead aroma to it too. On the palate is a deep concentration, ink, dark chocolate and raspberry candy.